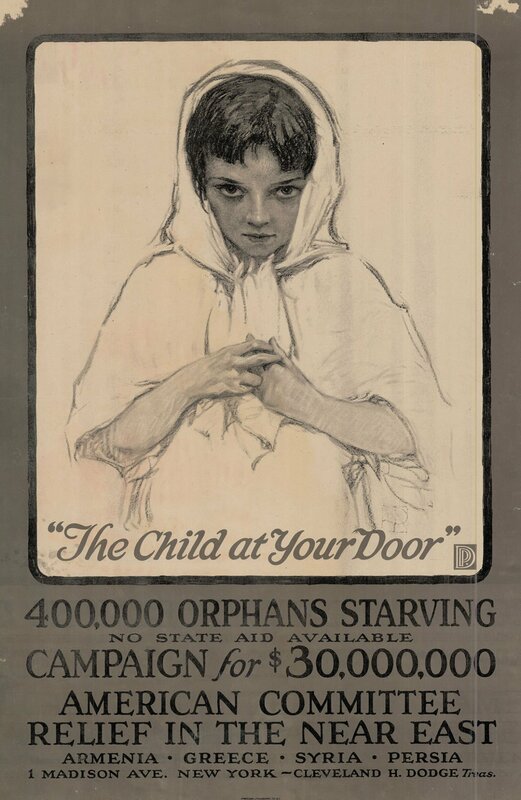 Poster from the American Committee for Relief in the Near East, 1918-1919. The organization, now known as the Near East Foundation, is the earliest American example of organized citizen philanthropy – fundraising specifically to aid refugee populations overseas. It began in 1915 in response to the Armenian genocide and then expanded its reach to include the countries named on this poster. "The War of Ideas: Propaganda Posters from the Vermont Historical Society Collections" Showcasing items from the Vermont Historical Society collections spanning the Civil War to World War II, April 15-October 25. Showcasing items from the Vermont Historical Society collections spanning the Civil War to World War II, visitors to this exhibit can examine how posters have been an important part of the wartime effort, for everything from recruitment to support on the homefront. In a pre-digital world, inspiring artwork and pithy phrases were a key way the United States government could boost patriotism and gain material support. Viewing these posters alongside each other allows you to see similarities and differences as that messaging evolved over a century. History Center exhibits are open 9am-4pm, Monday through Friday, and on Second Saturdays. Admission is by donation.